Avastin, also called Bevacizumab, is a drug that treats eye conditions like macular degeneration, diabetic macular edema and retinal vein occlusion. This drug was first FDA approved for cancerous tumor treatment but ophthalmologists quickly discovered its promise for the treatment of leaking blood vessels caused by many common eye diseases. Eye doctors are using the drug “off-label” ever since. 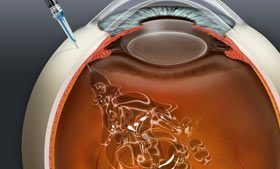 Since Bevacizumab is not FDA approved for use in the eye, its intraocular use is considered off-label. However, Avastin is now a mainstream treatment for wet macular degeneration and diabetic macular edema. Many “mainstream” treatments are done off-label – some examples are Aspirin, Botox and many of the common depression treatments. Intraocular use has become very popular and Bevacizumab is currently one of the most commonly used anti-VEGF medications in the United States. Although quite rare, some complications and side effects of Bevacizumab eye injections are being reported. Virtually every single intraocular medication has a risk of side effects. We will attempt to cover Bevacizumab complications in this Avastin Side Effects article. When doctors treat patients with certain types of cancer with intravenous Bevacizumab, a small amount of those patients experience serious and sometimes life-threatening complications. It is important to remember that these patients are also given 400 times the amount of the drug normally given to eye disease patients. Furthermore, cancer patients receive the treatment much more frequently. One study of patients who were treated with Bevacizumab intravenously reports only a mild elevation in blood pressure. Since the beginning of mainstream Bevacizumab use in the eye, the occurrence of side effects and complications from Bevacizumab are low. In most cases, a patient who receives Bevacizumab for an eye disease is in overall better health than a cancer patient – this would presumably reduce the risk of Avastin side effects, just on the basis of whole body health. The head-to-head data comparing IV Bevacizumab with intraocular Avastin side effects show the Bevacizumab given into the eye has none of the side effects of the IV treatments. Any medication has the potential to cause allergic reactions in a small number of people. Symptoms of an allergic reaction can include a rash, hives, itching, shortness of breath, and rarely, death (extremely rare). If you have allergies to other medicines, foods, or other things in the environment, or if you have asthma, you should let your ophthalmologist or his staff know. Being prone to allergies could be a red flag for your doctor to choose a different mode of treatment. Please understand that this page is NOT to be taken as medical advice. You should speak to your medical doctor and/or ophthalmologist about any concerns or possible side effects or complications from Avastin or any other eye medication. JirehDesign.com assumes no responsibility in terms of the accuracy of this content. All information on this website is certainly not intended to replace or even augment the relationship between a patient/site visitor and his/her physician. JirehDesign makes no claims to medical/surgical/anatomical accuracy of the images on this website. The images are not to be used for medical advice.